Are you looking for fun things to do with your kids this holiday season? Do you enjoy hosting little get togethers for your kids and their friends? Why not host a little holiday cookie decorating party. You can get your holiday baking done, have some fun with your kids, and let them learn how to do something in the kitchen while still using their creativity. Holiday cookies are a staple in most households. Everyone loves eating those sweet treats, especially when they are adorably festive elves, stars, Santa’s, snowmen, or gingerbread men. It can be a lot of fun to make your cookies as fancy or elaborately decorated as you want. Kids of all ages love to make their favorite holiday themed cookies, and with kids and a little icing the possibilities are endless. Your boys could create custom cookies that have their names on them, or feature their favorite holiday theme. Gingerbread men have been a favorite for years, especially the little houses they live in. Your kids can make them any color, add candy for fun accessories, and at the Ned of the day eat their delicious creations. Do your boys have a favorite superhero? Let them decorate their gingerbread men to look like Superman, Spider-Man, or Batman. Decorate a cookie that looks like each member of your family. No matter what you do the cookies will look amazing, and best of all the taste amazing too. Do you have a favorite icing recipe that you love to use each year? How about trying this fun and simple new recipe for icing or glaze. It is simple to work with, dries hard but not too hard to eat, and is delicious! You can even changed the color to any shade you want. 1. In a small bowl you will whisk together your confectioners sugar, corn syrup, and 1 tablespoon of milk. 2. Next add your food coloring. 3. If the glaze is the consistency you want fill your pastry bag or spread the glaze on your cookie. If you want it thinner add another 1/2 a teaspoon of milk at a time until you reach your desired consistency. 4. 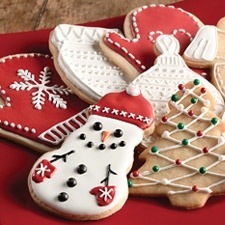 Decorate your cookies and enjoy a great sweet treat! This entry was posted in Activities, Food & Recipes and tagged Baking, cookie glaze, Cookies, holiday activities, holiday cookies, Holidays, parties, the boys store on December 22, 2012 by Lacy.